Description: 75 finished wooden blocks are stacked transversely into 25 layers to form a monument 4 feet high. Between 2 and 6 players take turns to remove a brick from the structure and place it on the very top without toppling the tower. A great game requiring skill and judgement, but not suitable for children. Our advice is to play this one outside or away from anything that can be damaged. 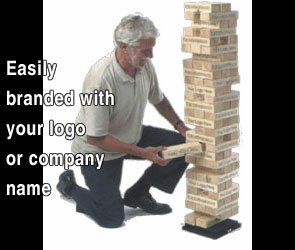 This game can be branded with your own logo.